Dental cabinet is made by the non-infectant material, complying with the international medical standards. Glass material tabletop, wearable, anti-chemical and easy to clean. We also can use other material such as the artificial marble to make the tabletop according to your preferences. Drawer is a combined type which adopts metal frame, using resistance slide, and perfect movement, smooth sliding, even under heavy load, can make the suitable movement. And the perfect silence makes you more comfortable when you work. 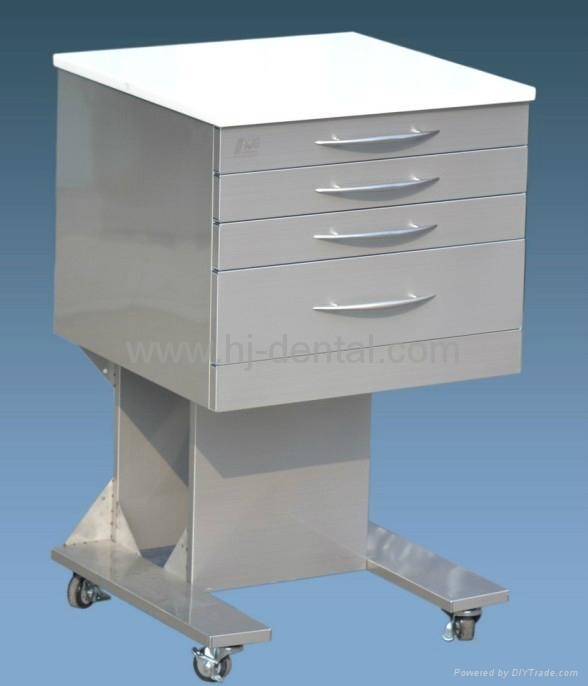 Dental cabinet can be matched by different medical boxes, which have gotten through the medical durable inspection, and can be divided freely. No restriction in the display, make your devices in order. The basin can choose ceramic or glass material, tolerance, easy to clean. Providing various type and size according to different treatment room and designed into type "T" and "-". Free single units combinations satisfy various size and shape. 5. Specially treated glass/artificial phoenix stone tabletop, with professional treating, wear and corrosion resistance, anti-penetration, no stain, easy to clean. 6. Cabinet with various functions can meet different needs. 7. The pulley with brake design enables the cabinet move easily with the dentists. 8. Standard configuration is glass tabletop. We may change to phoenix stone tabletop according to customers’ requirement.